We purchased our tickets days in advance then met up at my house sometime after 10pm. We gathered in the van and drove down to the “good theatre” (as opposed to the “bad theatre” where no one went unless that was the only showing in town). By 11 the lines were quite long. By 11:30 the entire north end of the mall was packed with people, many in costume. At 11:40 management opened the doors and the throng of people funneled in, all vying for a good seat. The excitement in the air was palpable, electric. As the lights went dark a collective hush washed through the crowd. The giant orchestral chord struck and out of nowhere, big yellow letters appeared on screen. The crowd erupted in whoops and cheers. For the first time older Millennials and young Gen-X-ers everywhere finally got to experience the film out of the confines of tv and on the massive landscape of the big screen. I’m talking of course of the 1997 re-release of Star Wars: A New Hope. phenomenon was born. For an entire decade children, teenagers and adults all around the globe were captivated by the wizarding world. Youth literacy rose at a staggering rate as children (and adults) not prone to reading suddenly became so engaged that they’d read the increasingly thick books in two or three days. Midnight book releases matched the excitement generally reserved for midnight cult movies and rock concerts. 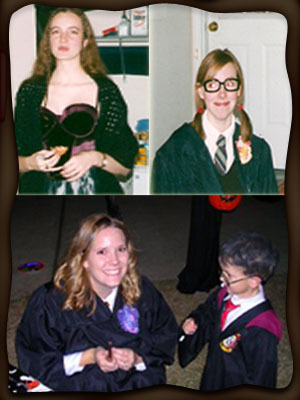 For the launch of the fourth book, Harry Potter and the Goblet of Fire, my mother’s bookstore held a midnight book party complete with costumes, treats, a reading of the first chapter and me dressed as Professor Trelawny telling fortunes. The final two installments, Harry Potter and the Half Blood Prince and Harry Potter and the Deathly Hallows, were released in the US in late July of 2005 and 2007, days before my families’ annual trip to Kanuga Conference Center for a week long summer retreat in the Blue Ridge Mountains. Kanuga is a very special place and families have been attending the same week of summer guest period for generations. People do a lot of reading during their week at Kanuga, and in the summers of 2005 and 2007 the campus was sprinkled with folks reading the same book. You couldn’t go anywhere without seeing someone with the latest Potter novel in hand. An unstated rule not to spoil the plot was adhered to and conversations ofter started with, “What page are you on?” Or you’d walk past someone absorbed in the magic and a simple “raise of the book” was enough to make a connection to last a lifetime. This is the thing about the Potter novels, they created a deep and powerful feeling of connection and community. Mention Olivander’s, Quidditch, or horcrux, and suddenly you are engaged in the shared imagination of millions. The release of the movies which began in 2001 was eagerly anticipated with excitement and trepidation. Could such beloved books be accurately translated to screen? For my part, I think Warner Brother’s has done a remarkable job morphing the books into film. Sure, a good bit had to be cut, but they have captured the spirit, if not the letter, of the series. From Chris Columbus’ sparkling telling of Sorcerer’s Stone and the vastly underrated Chamber of Secrets, to David Yates’ heart stealing interpretations of the final three books, the varying directors and their styles matched each novel well. The world watched the characters grow up in the pages of the books and the perfectly cast actors grow in height, acting ability, and depth on screen. The fervor of the movies only increased loyalty and readership of the books; a remarkable feat. Still, for me the most captivating thing about Potter Nation is that it centers not just around a series of books, but a series of books about death. In our culture, at least in our American culture, death is treated as “unnatural,” something to be avoided, or worse treated with gross irreverence. In the Potter books children are not shielded from the reality that all life ends (and not always peacefully) and that we all react to this awareness of mortality in different ways. The “Death Eaters,” the minions of Voldermort, the super villain, react to this knowledge by seeking power over others. They disregard the sanctity of life to abate their fear of death. The Aurors and people of light recognize death as a natural, albeit painful, event and embrace life as a time to engage fully in the gifts of love and relationship. They recognize the dark war they are thrust into as a necessary evil to prevent genocide and preserve life so that when death does happen, it does so reverently. The most stunning example of this play is between Harry and Voldermort. “Neither can live while the other survives.” 17 year old Harry’s life has been defined by death and over the course of the books he comes to the difficult realization that he must either die, or kill. In the end, he is killed, but because of a deep and powerful magic, does not die. Nor does he kill. It is his attempt to disarm Voldermort that links their wands, inadvertently casting Voldermort’s killing spell back on himself. Voldermort finally faces death by his own hand. This and the other potent themes in the Potter novels are a glaring perspective for a culture that has a tendency to tell children that their beloved pet has just moved to a farm upstate where she can enjoy wide open spaces, rather than letting them meet the reality of death and the pain of loss. And so it is, that as the last movie is released excitement fills the air. The costumed millions turn our for midnight launch parties and flock to the weekend release. Facebook and Twitter are brimming with posts and opinions and the language of the wizarding world. A global party is under way. Thank you J.K. Rowling for enlivening the world with a book about death. Ahh..those Harry Potter release parties, so many fond memories! What a gift J.K. Rowling has given to childrens’ literacy. I remember responses and phone calls the mornings after the releases from parents reporting their child, some as young a 8 or 9, had spent the night with a flashlight under their covers reading. I only hope that the younger afficiandos of the movies are also immersing themselves in the written world of Harry Potter. Thank you for your wonderful tribute to the depth and breadth of these novels which have united generations, and prayerfully will continue to do so for years to come. Yes, and one day you’ll get to read them to Nuka!